It’s the “Summer of Glass” at Biltmore and throughout the Blue Ridge Mountains! 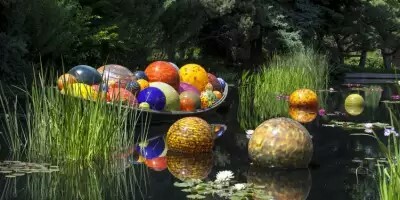 The Blue Ridge Mountains of North Carolina have long been associated with the art of glass and for years, and this year, due to the amazing Chihuly at Biltmore exhibition coming to the Estate (May-October 2018), the region is attracting masterful glass blowers, makers and artists from around the globe. From May 17 through October 7, 2018 – this new exhibition at Biltmore featuring multi-media artist Dale Chihuly’s monumental glass sculptures will be on display in the Winter Garden of Biltmore House and the Estate’s stunning gardens- Asheville. In honor of Western North Carolina’s deep history and international impact in glass arts, Burnsville and the Toe River Arts Council are joining area arts organizations, galleries and museums in celebrating the Summer of Glass. The community will be offering its own community-wide celebration of glass through both the historical and contemporary context of glass and its talented artists in Western North Carolina. See special local exhibitions, tours, workshops and events. Demonstrations of glass blowing, glass jewelry making, stained glass, enameling and working with glass beads will occur in artists’ studios, galleries and other locations across the city and surrounding region.